When I first saw it, I was dubious. I liked the mattress and the color scheme very much but it wasn’t love at first sight. The good stuff: I knew it was the right kind of feminine…so what I had assumed would be the hardest part was already taken care of. 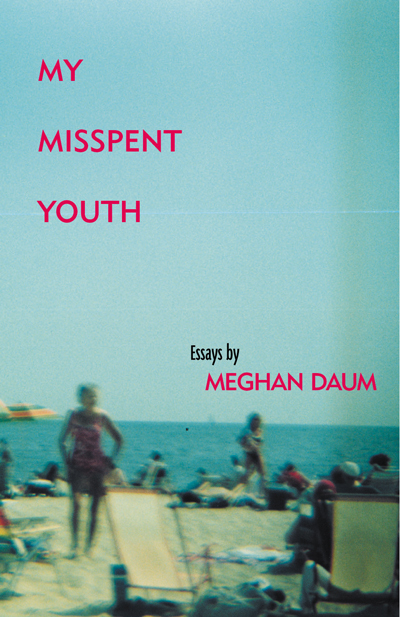 The last book of essays I had read by a woman (or the last full collection released in recent memory) was Megan Daum’s My Misspent Youth, and Open City did an extremely non-girly and beautiful cover for her. But in between that publication and mine, there were 184 trend pieces on the rise of “chick lit” and women’s fiction and the immense popularity of romantic ridiculousness. Of which my book had almost none. Still, having worked in book publishing, I knew I was in danger of a cover that implied the book would feature me dancing on bars or shoe shopping or doing both at the same time. I think the only reason my book didn’t have a martini glass shaped like a high heel on the cover was that I was told (and already knew, really) that “essays don’t sell.” Ever. So I think the brilliant designer, Ben, had the freedom to put something on the cover besides the back of some girl’s head or a pair of legs. Because Riverhead was wonderfully supportive but I don’t think they expected blockbuster lady-book club results. Still: I knew I wasn’t going to get away without a touch a of girlishness. So I was happy for the judicious use, and I think Ben knew that this was the perfect image for the book when he found it. I liked the old fashioned pattern and loved what I deemed the “good kind” of confusion (confusion is like cholesterol). Many people don’t realize it’s a mattress at first. Some thought it was wallpaper. Then it registers. Plus there’s a tiny call-back within the book in one of the shorter essays. I talk about jumping up and down on mattresses and tonally, that image represents the collection pretty accurately. Which was a bonus coincidence. The less-good stuff? I was genuinely worried about the prevalence of the pattern and how it wrapped around the entire book with no breaks, no containment and no frame. The entire image was also higher than it is now and so there was more floral imagery per square inch. Now there’s more of the plain part of the same mattress visible than there was on earlier drafts. That sounds silly now, as far as cover concerns go, but I remember thinking it was a big commitment to this one image. The reader’s eye had no breaks from it. Turns out I was totally wrong and have grown to love the cover so much, I wouldn’t have it any other way. My only other input was with the title. It was originally smaller, in color and on the upperrighthand side of the jacket. I suggested it be white or black and in all caps somewhere. I was adamant about the all-caps thing. 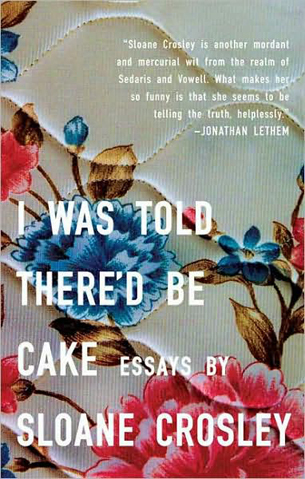 Between having “cake” in the title and a backdrop of flowers, I wanted to rough it up a bit. At one point I asked Ben about possibly putting stains on or tears in the mattress to achieve this effect. He very wisely shooed me away from both concepts. I actually had had the photo—this great shot of an old, ornately printed mattress—for quite a while, and had been sort of looking for something to do with it. It happened to fairly perfectly reference a part in one of the stories. There was something very close to the final cover in the first round of drafts I presented. We hashed out the details and tried different iterations in maybe 15-20 subsequent drafts, but I’d say the gist of the cover was done in the first take. Sloane was super cool and laid back. Once we had settled in on the imagery, we spent some time trying out different fonts and arrangements, as well as some variations on the concept. Through the whole process, she was both generous with feedback and suggesting directions, and open to ideas. Did the author reference the Meghan Daum cover to the designer? The color spectrums are very similar — maybe just kismet. The white-on-cream typeface is slyly gutsy and subversive – well done, all round.